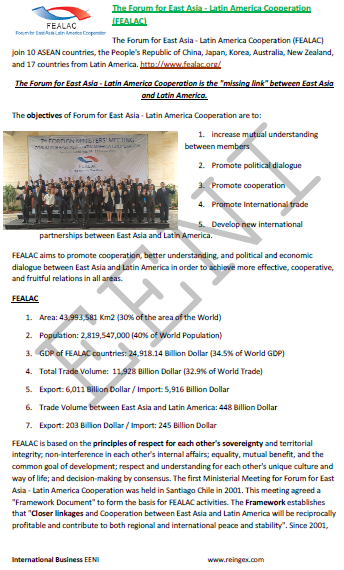 Syllabus of the Online Course (Subject): Forum for East Asia-Latin America Cooperation (FEALAC). Description of the Online Course: Forum for East Asia-Latin America Cooperation (FEALAC). 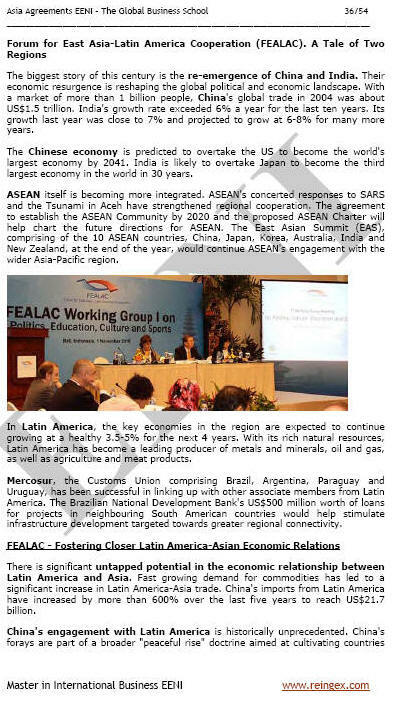 The Forum for East Asia-Latin America Cooperation (FEALAC) joins ten ASEAN countries, China, Japan, Korea, Australia, New Zealand, and seventeen Latin American countries. The Forum for East Asia-Latin America Cooperation is the “missing link” between East Asia and Latin America. The first Ministerial Meeting of the Forum for East Asia-Latin America Cooperation (FEALAC) took place in Santiago de Chile in 2001. This meeting agreed a “Framework Document” to form the basis for the FEALAC activities. Driven by the rise of the People's Republic of China and India, the old linkages are being revived and new ones forged between Latin America and Asia. International Trade between East Asia and Latin America has augmented.